Texas Hold'em and omaha computer poker analyzer system. The playing cards are marked inside with barcode marks (marked cards) and normal eyes can not notice it. Only our newest Omaha scanning system can detected these barcode marked playing cards and analyze the playing cards. 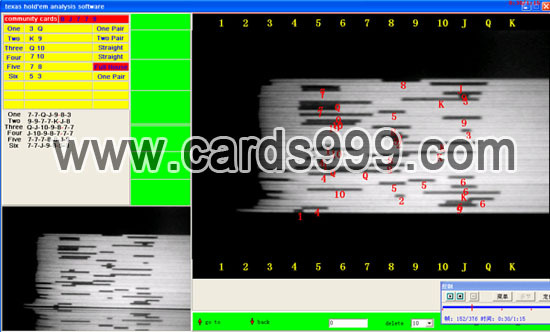 Within 0.5 second, the scanner camera can scan all the marked cards on the table and transfer the data to the laptop. You just need a partner in any places within 1000 meters to help you. The computer can analyze all the cards and your partner can tell you who the winner is in a quite short time by walkie-talkie. With this kind of computer analyzer system, you can play the poker games that you want, it is fit to all poker games, such as Texas Holdem, Omaha, Baccarat, Blackjack, Seka and so on. For the old poker scanner system, you are supposed to take a whole poker system device: a scanning camera, a poker analyzer, an earpiece. Now, you only need to take a scanner camera along with an earpiece, and then you can know the results. By the way, if you choose the long distance camera which can be installed in ceiling, TV, music box or some favorable places, you can only come with a mini spy earpiece.